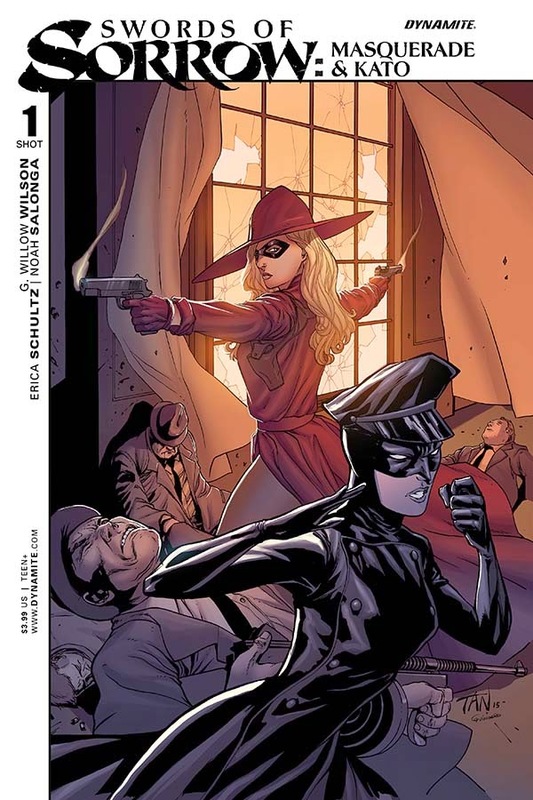 Dynamite's great crossover event continues with the first one-shot, Swords of Sorrow: Masquerade & Kato. It finds Masquerade hot on the trail of Kato, who she considers an outlaw, but some darker forces are afoot when the Black Beauty goes missing. This story establishes the duo's collaboration and what it means for the main Swords of Sorrow storyline. It's wall-to-wall action and beautifully illustrated. G. Willow Wilson and Erica Schultz do a great job of managing the present action while also trying to smoothly integrate the overall plot of the Swords of Sorrow event. It's not easy when you have to introduce your two main characters, explain the immediate danger they're both in and the villains behind it all. The majority of the time Masquerade is determined to bring down Kato but with the Black Beauty under someone else's reckless control there's little time for interrogation and more need for action. Both lead characters get to shine and come to an understanding which is good because they'll be working together to help bring down the evil Prince and his minions which include Purgatori who had a hand in this issues' shenanigans. Noah Salonga's art is clean with a kinetic energy absolutely vital in this issue full of car chases and fighting. He puts the emphasis squarely on the shoulders of his heroines and lets them both shine. Backgrounds are minimal and colors tend to run dark and earthy. Salonga helps to give the story a boost in pacing and layouts. Despite being a little predictable (we know they're going to get along and work together), Swords of Sorrow: Masquerade & Kato #1 is an exciting one-shot that wonderfully sets the stage for their collaboration going forward.